Far too often, "Lean Sigma" training is basically regular Six Sigma training (a rigorous and oft-helpful statistical methodology) with just a handful of superficial Lean tools. Lean is more than a bunch of tools. Lean is a philosophy and a management system. 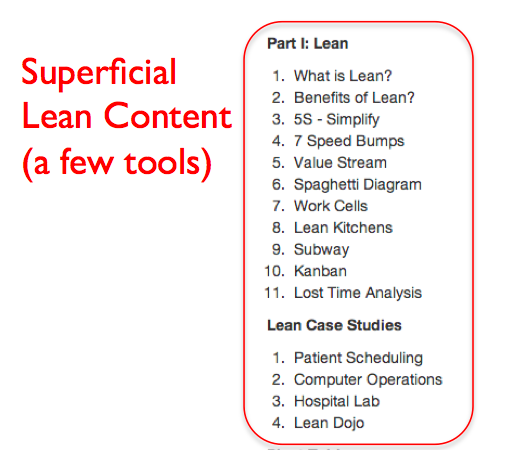 When the Lean component of "Lean Sigma" training is limited to 5S, the types of waste, value stream maps, and spaghetti diagrams... that's very superficial. As I've blogged about before, this approach should really be called "Lean Tools Six Sigma" or "5S Six Sigma." Where is the talk of culture? Where is the discussion about leading differently? This is not Lean, it's just tools. This is exactly what's on offer inside IBM as "Lean Six Sigma" and encourages spawning big, top-down projects with individually assignable financials, based on 6Sig methods... with VSM and 7 Wastes bolted on as tools. 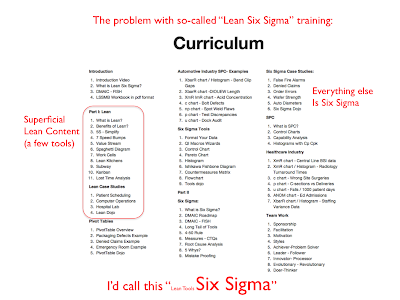 Irritatingly, it's not even generally called "Lean 6 Sigma" but more often just "Lean". It should be called just "Six Sigma" then. Hell, I'd even accept "Six Sigma Plus" as a name... they should leave the term "Lean" out of it.